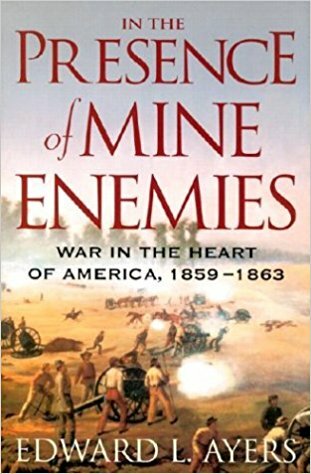 During my lifetime, I’ve read a fair amount about the Civil War, but two books that I read during the past few weeks bring home its reality in a new way. They show how different the war was to people at the time than it seems in the light of history, and how events could have turned out differently from the way they did. It was not inevitable that the war would last as long as it did, that the North would win or that slavery would have been abolished even if the North had won. 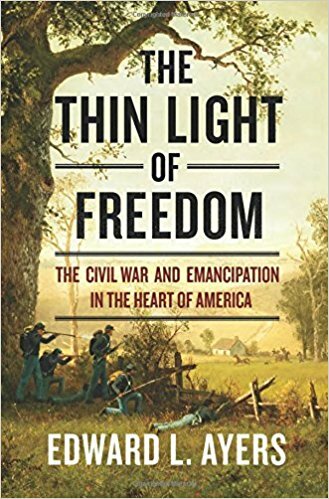 The two books are IN THE PRESENCE OF MINE ENEMIES: War in the Heart of America (2003) and THE THIN LIGHT OF FREEDOM: The Civil War and Emancipation in the Heart of America (2017) both by Edward L. Ayers. His window into the war is a collection of source material—letters, dairies, newspaper accounts and the like from two communities— Franklin County, Pa., and Augusta County, Va.—collected over a period of decades as part of a special project of the University of Virginia. The two counties are at opposite ends of the Great Valley running north and south between the Blue Ridge and the Appalachians, which was a major battleground of the war. They were more alike than they were different. Both consisted of prosperous small farms and small towns. Augusta was different from the plantation South; Franklin was more typical of the North. Ayers began with accounts of the 1859 celebration of the Fourth of July in the two counties. The white people of both considered themselves loyal to the Constitution and the Declaration of Independence. Both wanted to preserve the Union. Neither wanted to abolish slavery. Yet within a few years they were at war and hated each other. Reading these books helps me understand places such as Bosnia and Lebanon, which differing peoples can live together in peace for generations, yet, in a short period of time, be brought to the point of killing each other. In the 1860 election, Augusta County supported the Constitutional Union party, which was pro-slavery, but anti-secession. Franklin County supported the Republican Party, which was anti-slavery on only one point—that slavery should be barred from United States territories, in order to protect Northern white workers from competition with slave labor. Slaveowners in the Deep South saw this as an ultimate threat, because no new slave states would have been admitted to the Union, which in the long run would have made slaveowners a politically powerless minority. 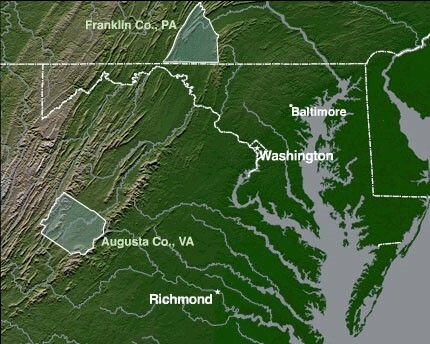 In Virginia, delegates from Augusta County voted against secession. But as secession proceeded, the question changed from favoring the Union vs. secession to favoring the North vs. the South. Once the decision was made, the anti-secession delegates fought bravely the Confederate Army or otherwise supported the war wholeheartedly. None foresaw how long the war would last, how many lives would be lost nor what the result would be. Ayers said the North might well have won the quick victory many of its leaders expected in 1861, if certain events in certain key battles had gone differently. If that had happened, the war would have ended with slavery still in place. The Constitution gave President Lincoln no authority to abolish slavery, until the Thirteenth Amendment was ratified in 1865. The rationale for the Emancipation Proclamation in 1863 was that it was war measure designed to weaken the Confederacy, by depriving the enemy of slave labor. The effect was that thousands of enslaved black people in the South sought protection behind Union lines, and thousands of black people in the North formed regiments that added considerably and maybe decisively to Union strength. Ayers thinks black people may have provided the margin of victory for the Union. At the time, though, it was not clear that emancipation was a winning strategy. It deprived the Union of loyal pro-slavery white people in the South. It strengthened Democratic opposition to the war in the North. It made a compromise peace impossible. Like the demand for “unconditional surrender” in World War Two, it guaranteed that the enemy would fight on until the end. Ayers described combat through letters and diaries of soldiers from the two counties, including black troops from Franklin County who joined the 54th and 55th Massachusetts infantry regiments. Both sides fought bravely and suffered much, but the Southern white troops fought more bravely, suffered more and, except in one important way, maintained a higher standard of conduct than the Yankees. Both sides seized cattle, horses, food stocks and other supplies when they marched through enemy territory. But the Confederate troops made a point of taking only what they could use, and paying for them—with Confederate money. In 1864, Confederate troops under Jubal Early burned Chambersburg, the county seat of Franklin County, to the ground after citizens failed to pay a ransom. But unlike the Union troops in the Great Valley, Confederates under General Lee generally did not engage in vandalism or destruction for their own sake. Confederate chivalry did not extend to African-Americans. In each of the Confederate incursions into Pennsylvania, they seized any black people they could find, including women and small children, and took them South to be sold into slavery. For them, any random back person was an escaped slave. Southern troops did not extend the rules of war to black troops. They regarded the arming of black people as a war crime, and they killed captured or wounded black troops. Union troops in the Great Valley burned great tracts of farmland and indiscriminately destroyed property they could not take. The destruction had a military purpose—to deny food and other supplies to Confederate troops fighting in Virginia. It succeeded. Lack of food and supplies left the Army of Northern Virginia hungry and ill-clothed. Some had scurvy from being malnourished. Boots wore out, and some troops marched and fought barefoot in the wintertime. But they fought on anyway. The North, in order to win, needed to completely subjugate the South, by any means necessary. The South only had to hold out until the North grew weary of the war. This was not an impossible strategy. But it meant more deaths, more destruction and a harsher peace than if they had given in earlier. Ayers believes the Confederates could have won. The Confederacy was united and, like most nations at war, suspended party politics for the duration. Not so the Union. The United States in 1864 (and again in 1944) was one of the few nations in modern history to have a contested national election while fighting a major war. Democrats opposed the draft and other war measures. Some were openly defeatist or pro-Confederate. The majority, like Democrats in Franklin County, favored “the Constitution as it is and the Union as it was”—that is, peace based on unconditional readmission of the seceded states to the Union with slavery intact. Lincoln expected to lose the 1864 election and, but for last-minute victories by Sherman and Grant, probably would have lost. If the Democrats had one, American slavery might well have endured well into the 20th century. But without political polarization, slavery might also have persisted past the end of the war. The fact that the most racist pro-slavery Northern white people supported the Democrats meant that they played no role in the Republican administration. The short-lived attempt to bring equal citizenship rights to black people in the South was fought by the Democrats, who campaigned North and South on a platform of white supremacy. Ayers doesn’t believe that Reconstruction would have turned out any differently if Lincoln had lived. Lincoln had two contradictory goals—to reconcile Northern and Southern white people, and to extend citizenship rights to black people. The only way to accomplish the latter was to deny citizenship rights to former supporters of the Confederacy. The Northern white people did not have the will or the wish to do this. In 1859, black people were second-class citizens in Franklin County and slaves in Augusta County. By 1869, they were second-class citizens in both counties. I have written about the big-picture implications of Ayers’ books, but their main value is his rich research and writing about the daily lives of the people of the two counties, North and South and black and white, and about the attitudes of the people in that era, so different from us today in some ways and so like us in others. 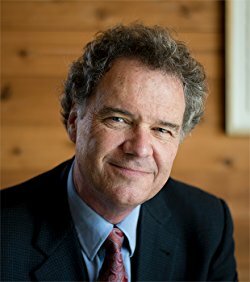 Like a novelist, he weaves together letters, diaries, newspaper accounts, reminiscences and other source material to tell a story of how war was experienced on the home front and in the field. He showed how differently these historical events were experienced by Northerners and Southerners, and by blacks and whites, and how differently they seemed at the time than they seem to us. Americans in the 20th century and so far in the 21st century have had the luxury of thinking about war as something that we go overseas to fight. Few if any of us can imagine war on American soil. Ayers’ books help us to see the reality of past war and possibly future war in the heart of America. This entry was posted on February 28, 2018 at 10:38 am and is filed under History, War and Peace. You can follow any responses to this entry through the RSS 2.0 feed. You can leave a response, or trackback from your own site. The North did not need to completely subjugate the South, seek to do so, or succeed in doing it; the goal was to end the revolt and reunite the Union.